The main objective for the overall design of this space was to create a "Living Kitchen" - a space that could be used as a central hub in the house where our clients could live day to day comfortably, as well as have plenty of room for entertaining. The existing kitchen space was half the size of the new area and separate from the existing family room. 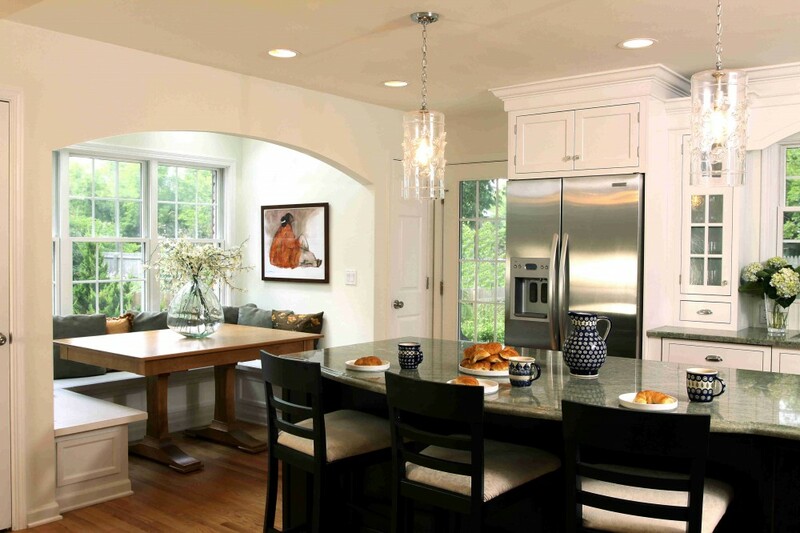 The project involved adding a small addition for the new eating area, and removing the entire wall that divided the kitchen to create a large, open great room. The new banquette allowed the entire family to eat in the kitchen without the need for a traditional table. The homeowner also expressed a strong desire for the new kitchen to feel timeless, but bright and modern. By using a white kitchen cabinet with a simple ageless door style, and combining that with a unique granite counter top and modern appliances, the desired look was acheived that will stand the test of time.